The church on the hill some four mille directly east of Willingdon has had a long, interesting and a times a rather turbulent history. 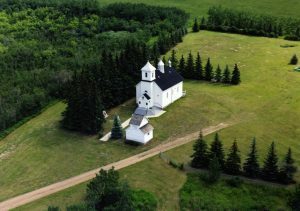 As early as 1900 when the first Romanian emigrants settled there, the more aggressive ones began to think of building a house of prayer. Already two person had passed away and there was no cemetery and no church. They needed such an edifice in which to baptize their newborn, in which to marry their youth, and from which to bury their dead. The first meeting was held in the home of Mitru Moscaliuk early in 1901 for the purpose of choosing a location for a cemetery and a church. According to earlier research done by a former local teacher, George N. Kelba, we learn that in 1901 a forty – acre parcel of land legally described as subdivision thirteen N.W. ¼, sec. 10, 56, 14, W.4th was purchased as homestead land, paid for and registered in the names of three elected trustees, namely, Ion T. Toma, Mihai T. Yurko and Konstantin Kachuk. A good deal of correspondence took place between this group and Ottawa, since Alberta was not yet a province and letters took a long time to reach their destination. However, progress was made towards the fulfillment of their hopes. 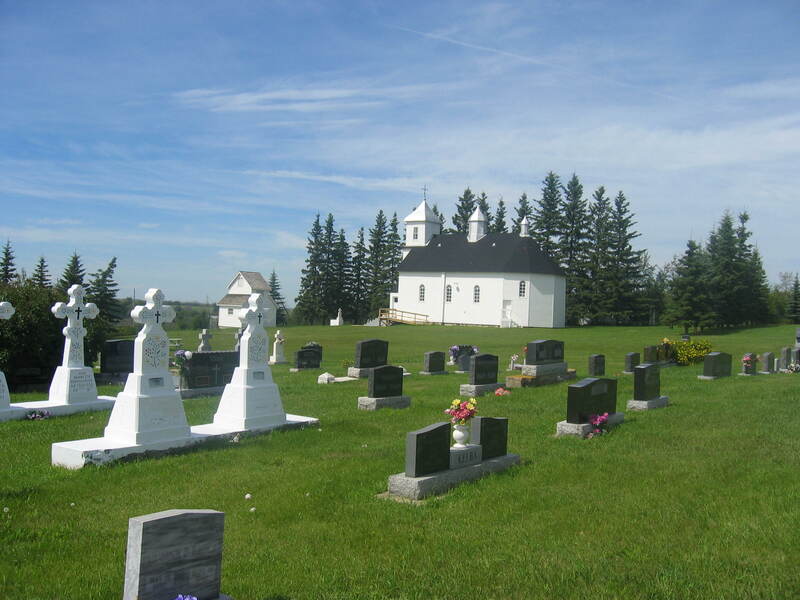 A Russian Orthodox missionary priest from Edmonton was invited to bless the cemetery once a site was selected. Then a committee was elected to make necessary arrangement for the erection of a church. It consisted of Ion T. Toma, Nicolai Iftody and Dumitu Moscaluk. 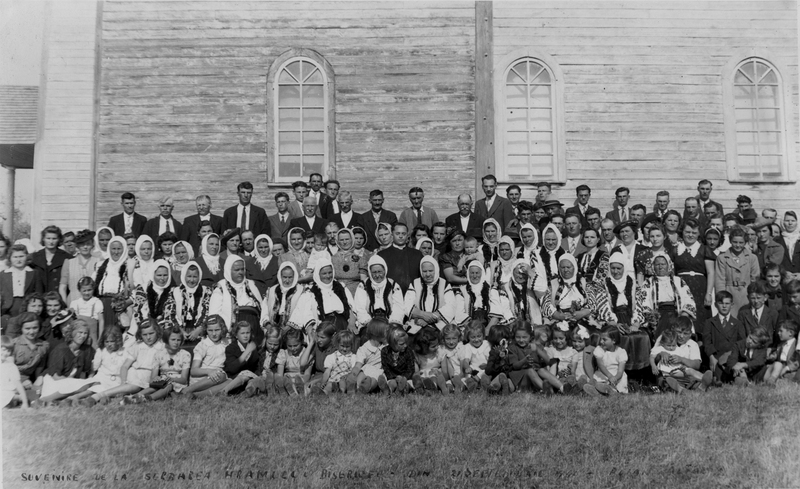 In the fall of 1903 Ion T. Toma, George T. Toma, and Dumitru Moscaliuk hauled huge stones from Ion Seminiuk’s and Nicolai Yurko’s farms to serve as foundation for the new church. Other men helped cut down tamarack logs and hauled them to the banks of the North Saskatchevan River at Desjarlais where some French sawyers operated a sawmill and squared the logs. Then these had to be hauled back to Boian some six miles south. Ion T. Toma, Dumitru Moscaliuk, George T. Toma and George Porozni Sr. played a major role in hauling these logs. At a subsequent meeting it was decided that each man was to donate twenty dollars in cash and volunteer twenty days of free labor. The chief carpenter was Elie Ravliuk and he was to be paid two hundred dollars for this majors project. The building was started and Ravliuk, without any blue prints, built it basing his design on what he could recall about the church in Boian, Bucovina. Typical of Orthodox churches, it includes a belfry (separate from the church), a cupola, cross on top, fan – light windows, the altar and sacristy. By the summer of 1905, the building was completed and a Russian Orthodox priest from Wostok, in all probability Father Mihailo Skibinski, was invited to come and consecrate the church. On Aug. 2 the consecration took place. What a joyous occasion for all the members! They came from far and near, on foot, or by wagons drawn by horses or oxen, following the trails that led to the church on the hill. Everyone enjoyed the festivities and left with a feeling of pride and satisfaction. In 1918 the building was covered with siding and the in 1948 stucco replaced the siding and the entrance was modified. The stone foundation was covered with concrete. The roof too has been repaired and active members of the community for having taken, through the years, such excellent care of the building that it is as solid today as the day it was completed. 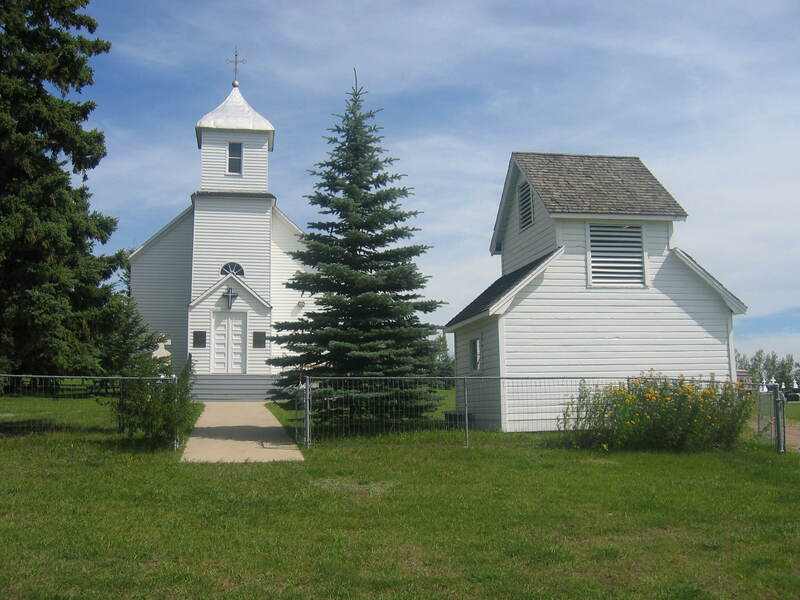 The church’s original designation was not St. Mary’s. Not only has ins name changed but its owners too. Research in the files of the Land Titles Office in Edmonton shows that in 1906 this property was registered as the Parish of St. Demetrius and the owner was the Bishop of the Russo – Greek Catholic Orthodox Church. In 1909 it became the Parish of Roumanish Greek Oriental Church of Soda Lake. The owner was “His Majesty the King in the Right of the Province of Alberta”. 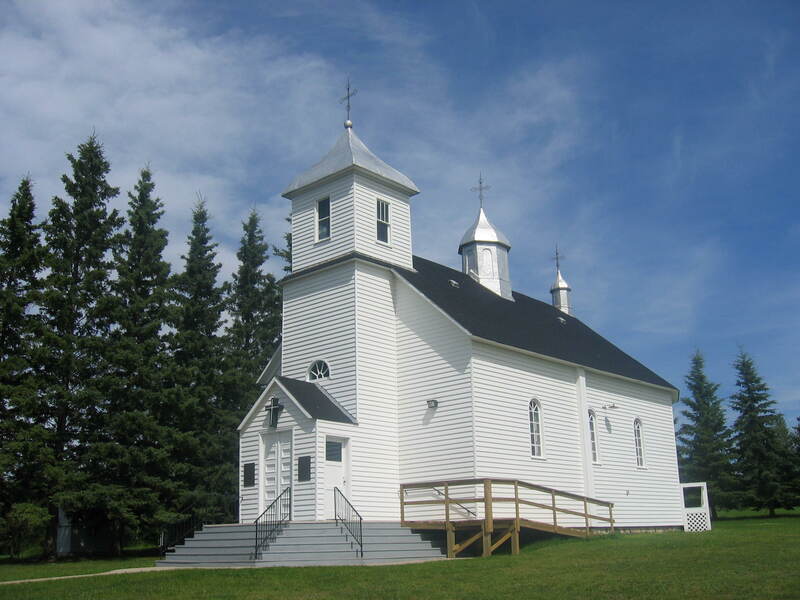 Then in 1945 the Certificate of Title states that “The St. Mary’s Roumanian Orthodox Parish of Boian, Alberta” is the owner. To conclude this part of the history of this church board drew up a realistic constitution and replaced the word “parish” by “congregation”. This place of worship has been in continuous use since it was built and is being used today. The church has been the scene of hundreds of church services, numerous christenings, weddings and funerals of the Romanian and Ukrainian people of the Orthodox faith. Because this church was one of the first to be built in the area some Ukrainian families because founding members as well. Among them were Gawrylo Lakusta, Sandyk Chebree, Mike Goroniuk, Vasile Chrapko and a few others. 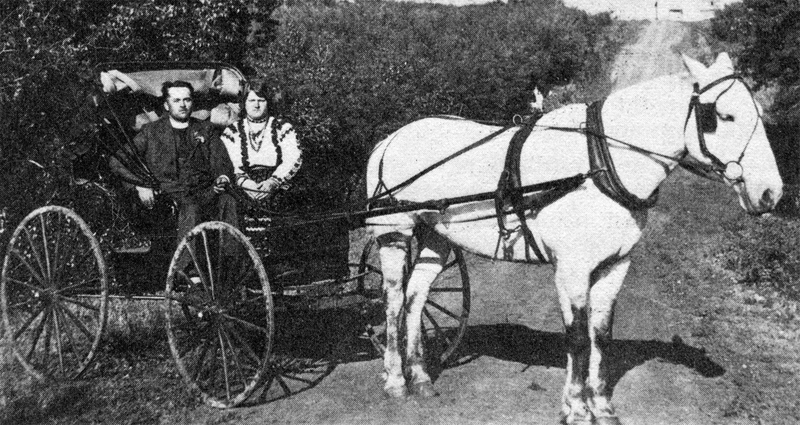 The Romanian Community of Boian and neighboring districts was far from other similar ethnic settlements. This and the fact that it was a rural community, it was difficult tot retain the services of a local priest for long periods of time. For these and other reasons priests came and vent. From 1905 till the forties there were at least twenty priests who served local churches. Most of these priests were bilingual, speaking Romanian and Ukrainian and some spoke English as well. Three of the more outstanding ones were Doctor Lazar Gherman, Vasile Cohan and Grigore Costea. 2005 – 100th anniversary celebration!